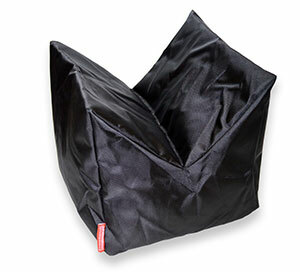 This is a durable, wear-proof and smart looking v-shaped multi use saddle pod bag, which comes pre-filled and ready to use. 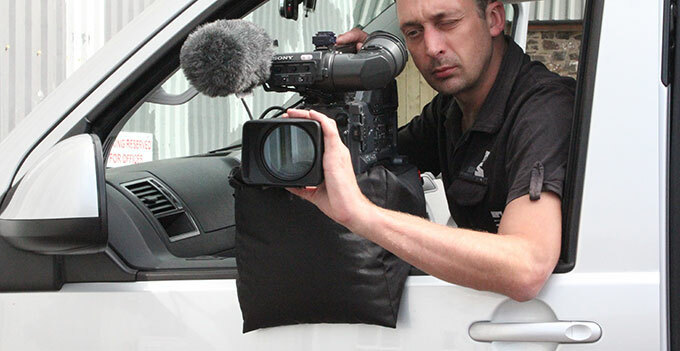 With the v-shaped cut out facing down this is perfect to place over an open window of a vehicle giving the operator a nice big surface upon which to place a camera, be it a full sized shoulder mounted camera, handheld obs doc camera like the canon xf305 or similar or even a DLSR like a 7D, the camera can be placed on top to give you nice stable shots or maybe a resting area for your arms and/or elbows to get that more creative shot that the editors are always screaming for! Now that's just in the V down position, with the V up and the flat side on the deck this versatile bag offers even more, perhaps you want a low down locked off shot, and you don't own baby legs. This is perfect to place your camera in between the v-shaped cut out, the cut out cradles and holds the camera and/or lens perfectly in the position that you need. It's light weight and rugged enough just to throw in the back of your wagon. It's super quick to set up and it also makes a nice pillow for long journeys. Self opp-ing has also been an issue when it comes to the amount of kit we have to carry around and nowadays we have to be so careful about health and safety in the work place and locations; booms and tripods are always getting kicked, bumped in to and knocked over. To have a large tungsten lamp head come smashing down hurts in a number of ways, the pocket, for when the lamp goes pop and if it hits someone on the way down, I suppose it would hurt them as well! There is a solution. 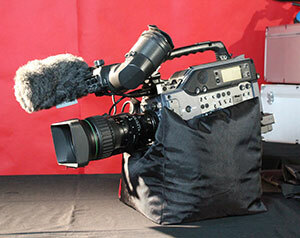 You could put a bag of leads at the base of your tripod, but that looks naff, or you could get a Sand Bag! I've looked around on the web and I've seen a few bags for sale, but none as good as those from StandbagsDirect.co.uk. I ordered one to see what it was like and it was delivered super quick. It's made from a heavy duty wear-proof material. Each side of the bag will comfortably take 5lb of sand (so that's 10lb per bag), and more if required. It is secured by a double zip so it can't escape and get all over your kit. So now I have safe and stable tripods, which leads me neatly on to another one of their products, the Boom Bag! A simple but effective counter balance for a boom on a tripod, once you have your boom out full with a 416 on the end it can get a little front heavy. Place up to 4 x 500ml water bottles in the pockets of the boom bag, then slide over the end of the boom, job done. No need to have sand with you, just get some water from the garage and you're away! Another safe and stable tripod where ever you are filming.